Tungsten, also known as Wolfram, is a metallic chemical element extracted from scheelite and wolframite. It is not found in a pure form in nature and mostly sourced from Russia, Austria, China and Portugal. By itself, Tungsten is a very hard, brittle, gray-white metal that is very resistant to corrosion. It has the highest tensile strength and melting point (6,170 Degrees Fahrenheit) of any other metal. 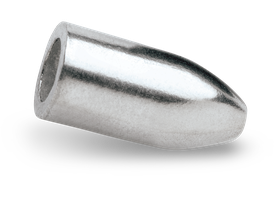 Tungsten is 40% more dense than lead, making a harder, smaller profile, more compact weight. This helps to decrease snags & drag and allows the weight to transmit vibration more readily. When tungsten hits an object under water it transmits most of the vibration to the line which in turn travels to the angler, allowing the angler to better identify what the weight is hitting, while the softer lead absorbs and dampens some of the vibration. Another advantage is the fact that tungsten will not deform and eventually cut the line. A 1 oz Lead Weight takes up 40% more space than a 1 oz Tungsten Weight.